I think I forgot to mention, here, I posted a new essay over at The Nervous Breakdown. 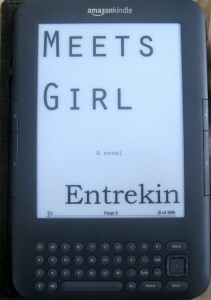 In which I fawn hyperbolically over the new Kindle. In an era of totally undeserved hype (I’m looking at you, Jonathan Franzen), the Kindle is a magical device. I’ve been using it for about two weeks now. First book: Lev Grossman’s The Magicians, which was a little like Harry Potter Goes to College, and started crazily strong, but then flopped in the final act, sadly. Disappointing, ultimately. I like reading on it, and after a couple of weeks, I’m very glad I chose it over the iPad. It wasn’t merely a financial consideration. I just already have a laptop and a phone, and I wasn’t sure what I’d be using the iPad for. I need a keyboard to write (and I know I can get a bluetooth attachment, but that’s beside the point). Still, I understand why the iPad is overtaking the netbook category, mostly. In terms of a dedicated digital reader, however, so far, the Kindle has been excellent. I like that it’s dedicated, too, like a book or a novel; when I’m reading a book, I’m reading the story. Not clicking around, not opening apps, not tweeting and Facebooking. In the spirit of making Meets Girl available on it, I’ve been doing the necessary formatting and lay-out. It’s not difficult; Kindle mainly uses html. I’ll explain more about it at some point, when I’m done experimenting and learning it. I should note that first image is not actually the Kindle file; it’s a PDF. 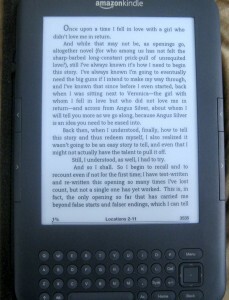 Which the Kindle can display, natively. In terms of lay-out, though, the pagination and formatting both leave much to be desired. Today, I woke up to an email from Barnes & Noble. Pubit, a program they had announced several months ago with the intention of going live over the summer, was finally implemented today. I’ve already signed up for an account and can start uploading files. I’d originally planned to make Meets Girl a Kindle exclusive (given that Kindle is cross-platform and available, as an app, on pretty much anything), but then I started wondering why I wanted to limit choices. The whole point is to make the story available to anyone and everyone who wants it, including all the people who are getting a nook anytime soon. So it will be. It may be a little while longer getting to the nook, but I’ll have it there, too.